Climate Interactive, working with our partners at University Mohammed VI Polytechnic (UM6P) in Morocco, has completed the second major model release for our Climate Smart Agriculture in Africa project. Now titled the Agriculture and Land Policy Simulator (ALPS), it builds upon the versions introduced this spring and last fall. This system dynamics decision support tool helps policymakers see what could work in agriculture. Agriculture is important as African countries seek policies and actions to feed their growing populations and build their economies, while simultaneously reducing the environmental impact of farming. But these decisions also interact with climate change and resilience, particularly through agriculture’s effect on land use. We’ve improved our land use sector in this iteration of the simulator so we can better capture important details and interactions. Land use decisions are important in addressing climate change, particularly in Africa. 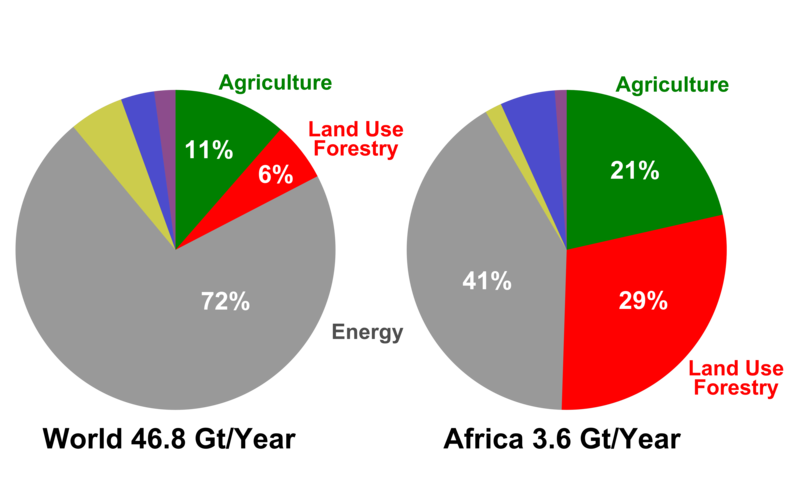 For the continent as a whole, emissions from land use and forestry are even higher than those from agriculture, and together these two categories account for half of all greenhouse gas emissions. As a result, African countries trying to reduce their climate impact include land use changes as part of their climate strategies, often integrated with their agriculture strategies. 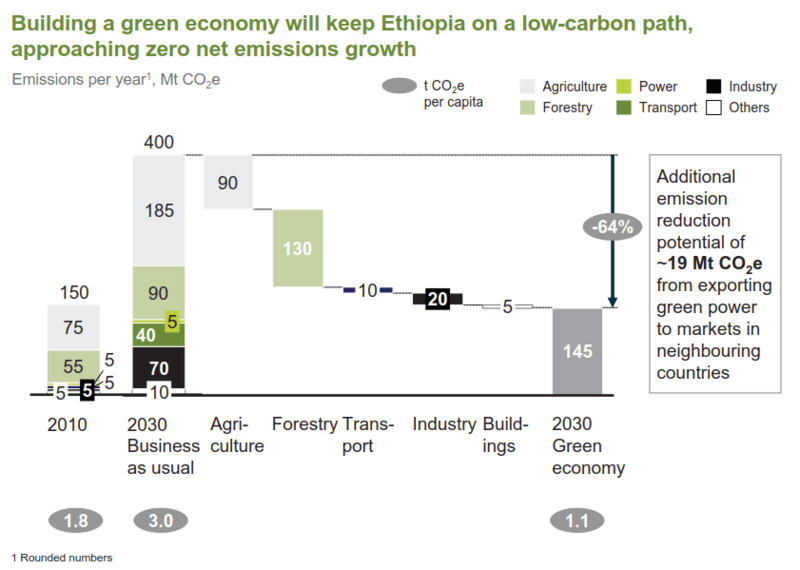 For example, Ethiopia’s Climate Resilient Green Economy plan includes goals to have no net increase in emissions by 2030, while their economy grows. Forestry is a major part of that plan; instead of a business-as-usual 90 Mt CO2 per year of forestry emissions, the goal is to have 40 Mt CO2 per year removals by increasing tree cover. These CO2 removals can offset some of the emissions from other parts of the economy, because those emissions are planned to be lower than business as usual. A tool to assess coordinated policies could help evaluate these goals. In addition, a great deal of attention is being paid to soil carbon, both generally and specifically in African agriculture. Techniques exist to retain carbon in soil and biomass, and even to absorb CO2 while restoring degraded soils. In addition to the climate impact, retaining and increasing soil carbon can also help with water retention and crop fertility. 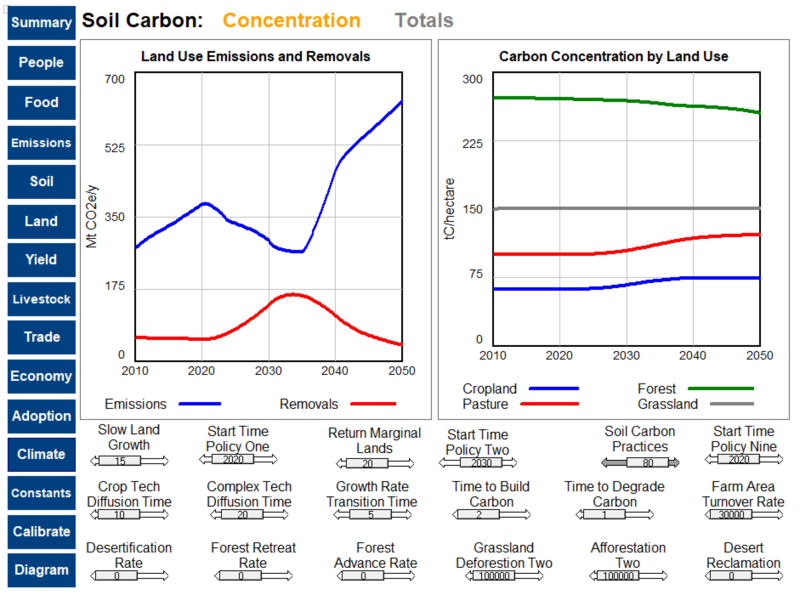 We improved the simulator to include forestry land use and soil carbon. Using the lessons from our preliminary soil carbon model, we improved the land use change sector, making it easy to simulate how agriculture decisions affect deforestation. We separated desert from other land and included desertification along with other causes of land cover changes. We added the carbon content of each land use category, and allow that carbon concentration – soil organic carbon plus biomass – to change. Together, these improvements make it possible to look at a range of agriculture policies and practices and see their impact on food and greenhouse gas production. At the same time, we started including the contributions of agriculture to the economy. We added estimates of the economic value of production, exports, imports, and losses to the model. Together, these changes will improve the ability to look at a full range of agriculture and land strategies in the face of climate change. Our preliminary work pointed out how delays and finite capacity limited the impact of isolated soil carbon policies; now we will be able to look at changes in the context of agriculture and environmental effects. We will describe findings from our ongoing analysis in future posts. We will continue to iterate as well, improving our simulator by adding additional sectors and incorporating data as it becomes available. As we continue to develop the Agriculture and Land Policy Simulator (ALPS), we will concentrate on details that make the tool most useful for policymakers and other users. To contribute or make suggestions, contact Travis Franck.